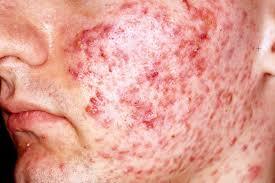 Acne vulgaris is an inflammatory disease of the sebaceous follicles. Acne eruptions are initiated by increased sebum production activated by androgenic hormones. Sebum is secreted into dilated hair follicles containing normal skin bacteria. The bacteria secrete the enzyme lipase, which reacts with sebum to produce free fatty acids to trigger inflammation. At the same time, keratin produced by the hair follicles combines with sebum to form plugs in dilated follicles. The goals of management are to reduce bacterial colonies, decrease sebaceous gland activity, prevent the follicles from becoming plugged, reduce inflammation, combat secondary infection, minimize scarring and eliminate factors that predispose the person to acne. 1. Administer prescribed medications, which may include acne products containing benzoyl peroxide (explain that these products initially cause skin redness and scaling but that the skin adjusts quickly); topical agents, such as vitamin A acid; and antibiotics such as tetracycline. o Advise the client that heat, humidity, and perspiration exacerbate acne. Explain that uncleanliness, dietary indiscretions, menstrual cycle, and other myths are not responsible for acne. o Explain that it will take 4 to 6 weeks of compliance with the treatment regimen to obtain results. o Instruct the client to wash his face gently (do not scrub) with mild soap twice daily. o Instruct the client not to squeeze blackheads, not to prop hands on or rub the face, to wash hair daily and keep it off the face, and to use cosmetics cautiously because some may exacerbate acne. o nstruct the female client to inform her health care provider if she is possibly pregnant. Some medication, such as systemic retinoic acid, have teratogenic effects, therefore a pregnancy test is required prior to treatment and strict birth-control measures are use throughout pregnancy.